The College of Business at the University of Central Oklahoma was established in 1971 in Edmond, Oklahoma, and has grown into one of the largest colleges at the regional, public university. The UCO College of Business offers 13 bachelor’s degrees in six departments, as well as an esteemed Master of Business Administration (MBA) program. The college is ranked among the 100 largest business schools in the nation, with more than 2,600 students enrolled. In early 2017, the college hoped to launch a fundraising campaign to increase the college’s ability to support student programs, recruit and retain elite staff members and build new facilities on the UCO campus. 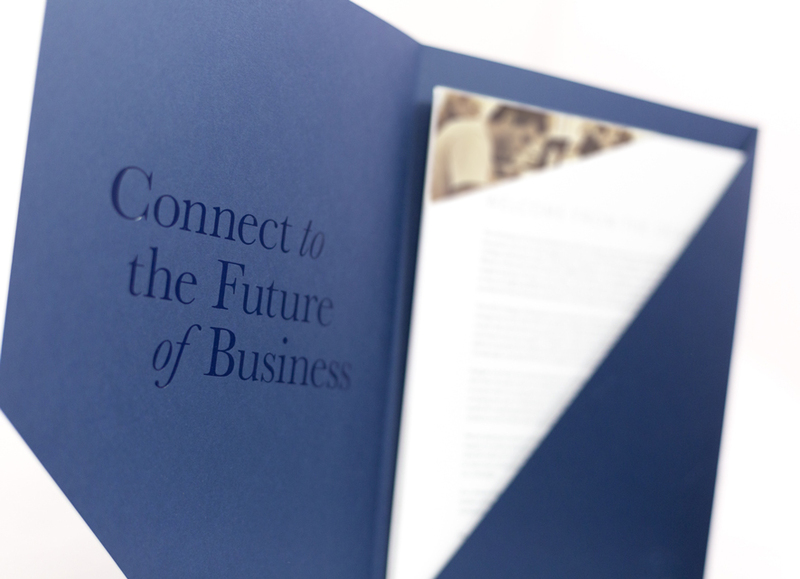 The college’s slogan “connect to the future of business” would be the central focus of the campaign. The slogan encompasses the potential for the campaign to provide a promising and bright future for the College of Business and its students. The UCO College of Business began working with Koch Communications to develop materials to aid their upcoming fundraising efforts. Koch Comm was asked to create different print pieces that would be presented to potential donors. Each piece needed to share the vision of the campaign and information about specific funding opportunities ranging from $2,000 to more than $1 million. Some potential donors would receive all of the pieces of content, and some would only receive one or two. This presented a challenge to create something nonlinear that allowed the college’s dean and other leaders freedom to use different pieces as necessary. Koch Comm needed to create pieces of a puzzle knowing that not everyone would see all the pieces. Yet, the project and its design needed to work whether the prospective donor was seeing two pieces or five pieces. 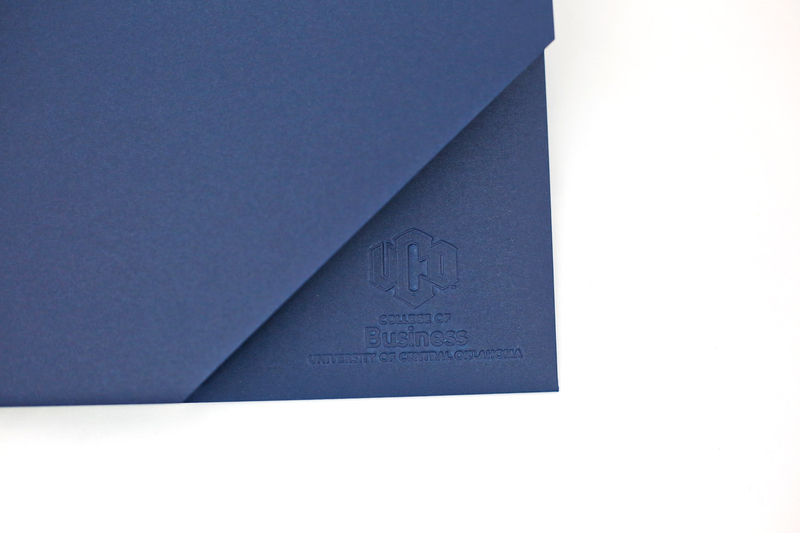 Additionally, although the final product needed to be distinctive and compelling, it was also essential that it was cohesive and consistent with the UCO brand. The pieces needed to be high end to appeal to affluent potential donors through specialty printing and design while also staying true to the university’s traditional navy and gold. Koch Comm sought to address these challenges and develop a product that would exceed the college’s expectations and fulfill their needs. Collaboration with the client and with internal team members was essential for success. The project required content writing, photography, design and printing, and all were dependent upon excellent internal communication among the team. 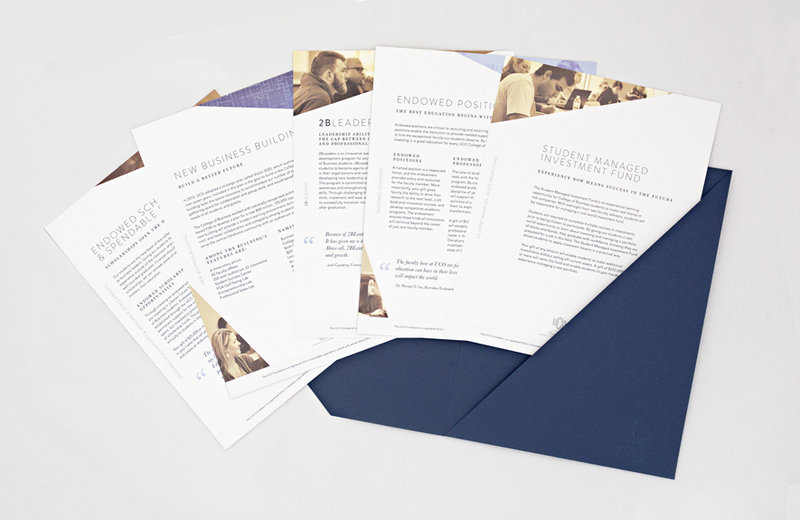 After meeting with the client to understand their needs and challenges, the Koch Comm team worked to draft content and develop potential design options. Koch Comm initially presented three layout options. Each design varied in formality, but all three met the functional and design needs of the campaign. The college’s leadership chose one of the three designs presented. The final product had very few changes from the initial presentation, indicative of the design team’s ability to present fully formed concepts and aptitude to work with the client to refine. The design chosen heavily featured photography throughout. The college wanted the fundraising pieces to be a reflection of the student body through both photography and quotes from students and faculty within the individual pages. In order to provide the highest quality and most authentic piece to the donors, the photographs needed to feature students and faculty within the College of Business. A photo shoot on campus was scheduled and executed by the Koch Comm team. The photos from the shoot were used throughout the fundraising pieces and provided to the college for their use. Koch Comm knew creating a product that was cohesive and consistent with the UCO brand while also impressing the audience was essential. This meant exploring specialty printing options for the product, meeting with the printer to choose a paper stock that could hold the specialty printing and going to the press in person for print checks throughout the printing process. 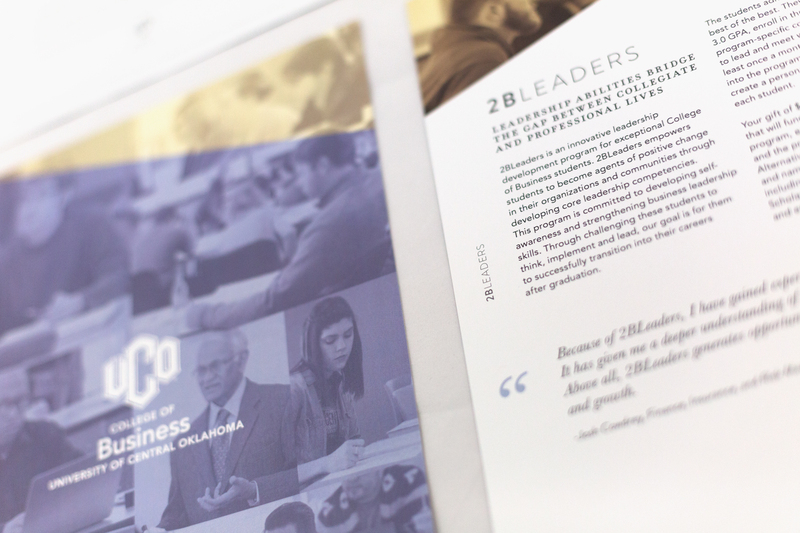 Koch Comm and the UCO College of Business collaborated throughout the entire process to communicate progress and talk through options for paper, content and photography. For the final product, the Koch Comm team created a non-linear visual language that allowed for variation from page to page to make each funding opportunity stand out while following the established look and brand colors. Layout variation, excellent photography and alternating brand colors allowed each page to be distinct but all fit within the same family. 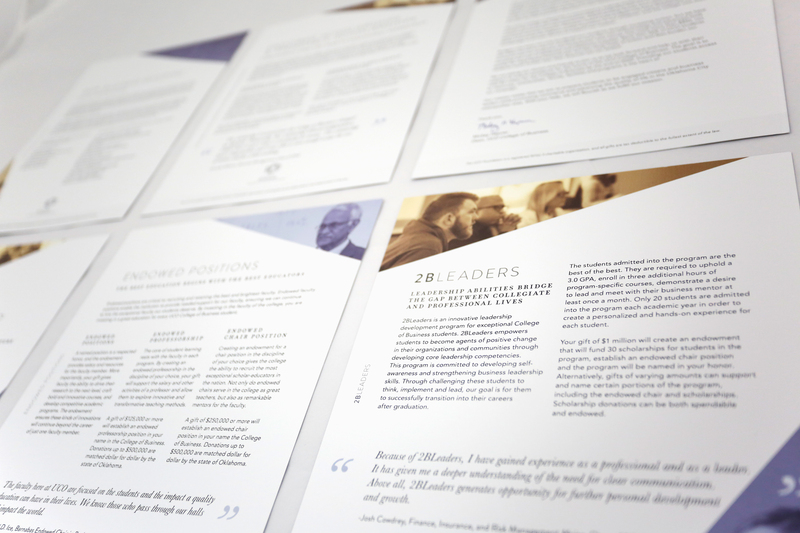 This design allowed pages to quickly be removed to fit the needs and profile of each prospective donor. After working together to bring all of the pieces together – written content, editing, photography, art direction, design and print production oversight – the client was pleased with both the content and the printing and is currently using the piece to solicit funding.